The connection between our diets and brain function is an intriguing topic. At Brain Balance, we work to improve behaviors, attention and focus, mental health, sensory processing disorders and so much more that stems from our brain health. There are numerous factors that can play into the health of our brains, and one key, controllable factor is nutrition. Nutrition can be so complex, so we are going to break it down for you! The keys to brain health are a nutritious diet rich in omega-3s, antioxidants, and vitamin E.
Omega-3s are “essential” fatty acids that our bodies need but can’t make on their own. We must rely on our diet to get enough of them. Omega-3’s are involved in neurotransmitter synthesis in our brains and can improve learning and memory. They also reduce inflammation and oxidative stress, which helps fight against mental disorders such as depression, mood disorders, ADHD and other mental health issues. Antioxidants are especially important for brain health. The brain is highly susceptible to oxidative stress. Antioxidants reduce oxidative stress, stimulate blood flow and encourage neuron and blood vessel growth in parts of the brain involved in memory and learning. Vitamin E is also an antioxidant that helps preserve brain function and protect against neuronal degeneration. Here is a list of some delicious, brain-boosting snacks that may positively affect your child’s cognitive processes, emotions, and give them the very best chance to live their happiest lives. Avocado Toast - Avocados are rich in monounsaturated fatty acids that improve our cognitive function and lower inflammation. Pair that with whole-grain gluten-free bread, drizzle a little bit of olive oil, salt, and pepper and you have a tasty brain-boosting snack. Tuna Salad with Whole-Grain Gluten-Free Crackers - Tuna is a great option for (healthy) fatty fish. Pair it with some whole-grains for a perfect mid-day snack! Green Smoothie - Smoothies can be a great way to get in some extra fruits and vegetables into our day. Add some nut-butter, avocado, chia or flaxseed for an added omega-3 and vitamin E boost. For our picky eaters, you can try freezing them in popsicle molds for a fun, refreshing twist! Kale Chips - Green, leafy vegetables are loaded with so many wonderful vitamins and minerals, including vitamin E. What better way to eat them than in chip form! Just toss them in some olive oil, salt, and pepper to taste. Apple Slices with Almond Butter (or any nut butter of your liking!) - Apples are rich in many vitamins and minerals, and almond butter, is rich in vitamin E and omega-3’s, which can help slow the release of naturally occurring sugar and prevent a blood sugar spike. Homemade Trail Mix - You can mix and match different dried fruits with nuts and seeds of your choice. Add some cacao nibs for another antioxidant boost. Directions- Line a baking sheet with parchment or wax paper.- Melt the dark chocolate chips in a microwave-safe dish. Cook for 3 minutes at 50% power. - Stir the blueberries into the melted dark chocolate.- Using a soup-spoon (or something of a similar size), spoon clumps of the melted dark chocolate and blueberries onto the parchment paper-lined baking sheet.- Sprinkle each cluster with the almonds or nut of choice.- Place in refrigerator for approximately 30 minutes to set. Plate and enjoy! 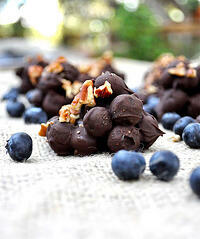 Cocoa and berries are rich in antioxidants and whole almonds are rich in omega-3s and fiber. This is a perfect brain boosting sweet treat! Snacks don’t always have to be complicated. They can be as simple as a piece of fruit with some nut butter, or a handful of nuts with dried fruit. Find which brain-boosting snacks your child likes best and keep those on hand. You can even get your kiddos involved in making decisions and let them choose which combo of healthy fats and other antioxidant-rich foods they like!